Three CAFNR students were named to the Mizzou '39 and Mizzou 18 awards. From left to right they are: Brooke Novinger, Rebecca Mott and Rachel Owen. Photo courtesy of the Mizzou Alumni Association. Every year, Mizzou recognizes 39 seniors and 18 graduate students to honor the school’s founding in 1839. The students represent various majors, activities and organization across campus and are selected based on their academic achievement, leadership and commitment to MU and the community. 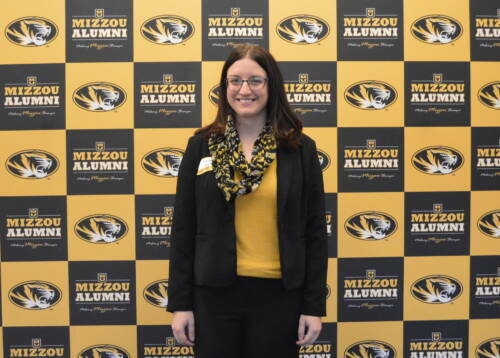 CAFNR senior Brooke Novinger was chosen for the Mizzou ’39 award. 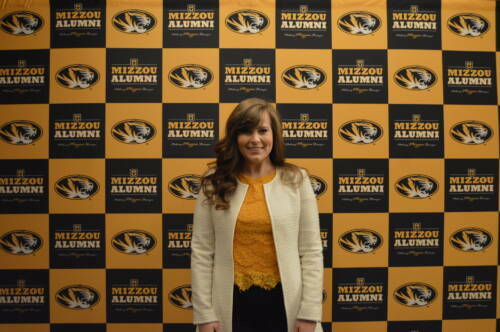 Two CAFNR graduate students were chosen for the Mizzou 18 award: Rebecca Mott and Rachel Owen. Brooke Novinger has already attended three College of Agriculture, Food and Natural Resources graduations – singing the National Anthem and Alma Mater. This year, Brooke will attend the CAFNR graduation again, but this time, she will be in a cap and gown herself. Brooke said she was in awe when she found out she had been selected as a recipient of the Mizzou ’39 award. Brooke’s pride for Mizzou began over two decades ago when she attended her first Mizzou Homecoming at 3 years old. Later, she would find herself tasked with upholding the tradition of MU Homecoming as a Homecoming Tri-Director. Brooke Novinger, a senior studying biochemistry, was recently named a recipient of the Mizzou ’39 award. Photo courtesy of the Mizzou Alumni Association. Growing up on her family’s farm near Kirksville, Missouri, Brooke said she learned to appreciate agriculture and the life lessons that came with having an agricultural background. Brooke said her father and numerous cousins graduated from MU with degrees from CAFNR. Brooke and her brother, Grant, will both graduate from CAFNR together this May, Brooke with a Bachelor of Science in biochemistry and Grant with a Bachelor of Science in agribusiness management. Aly Friend, former MU coordinator of student and alumni programs, has served as a mentor to Brooke during her time on campus. Brooke encourages incoming freshmen to find “their people” at MU. After graduating from MU in 1995 with a bachelor’s in music education, Rebecca Mott’s goal was to teach music in rural Missouri for the rest of her life. That’s what she did for over a decade before moving back to Columbia, when her career took a turn after taking a position at MU working for Extension. “I wasn’t here very long before I realized that I missed students like crazy and that I would have to do something with students,” Rebecca said. It was this realization that pushed her to pursue her master’s and then her Ph.D. in agricultural education and leadership at MU. CAFNR doctoral candidate in agricultural education and leadership, Rebecca Mott, was recently … Expand ▸CAFNR doctoral candidate in agricultural education and leadership, Rebecca Mott, was recently selected as a recipient of the Mizzou 18 award. Photo courtesy of the Mizzou Alumni Association. “All through high school, I was passionate about both music and agriculture,” said Rebecca, who grew up on a registered polled Hereford cattle farm. Eighteen years after obtaining her bachelor’s degree, Rebecca visited the office of Jon Simonsen, the director of graduate studies for agricultural education and leadership. That was one of Rebecca’s biggest challenges here at MU – accepting the fact that her path was different than other students. Since her bachelor’s degree was in music education, Rebecca didn’t know if there was a strong enough link to pursue a master’s in agricultural education and leadership, let alone a Ph.D. She said Simonsen was very open to talking about something even a little outside of the box. That was the start of Rebecca pursuing her master’s, and then later her Ph.D., all while working full-time at MU. Rebecca said she felt honored to be named to the Mizzou 18, especially as a non-traditional student. There were many mentors who helped her along the way, too. Jo Britt-Rankin, associate dean and extension professor, provided Rebecca with opportunities to figure out how her work, job and research could align. Anna Ball, professor in agricultural education and leadership, was the reason Rebecca fell in love with research. Simonsen was open to taking a chance on someone who was different than the traditional student. Rebecca said she admires the way John Tummons, assistant teaching professor and director of undergraduate studies for agricultural education and leadership, works with undergraduate students and that she always learned from osmosis when around Kimberly Keller, assistant research professor and evaluation coordinator for human environmental sciences extension. “There’s a lot,” Rebecca said with a laugh. As for the future, she plans on staying right here at MU. As of March 1, Rebecca is an assistant extension professor housed in the College of Human Environmental Sciences (HES). Her appointment is split with CAFNR, so she will also teach for agricultural education and leadership, in addition, to continue doing program evaluation work for HES. When Rachel Owen looks back on some of her favorite memories at MU, she won’t just be reminded of late nights leaving the lab she worked in, looking up to see Memorial Union or Jesse Hall lit up on campus, but of the legacy she’s leaving in Missouri. Rachel is a Ph.D. candidate in natural resources, with an emphasis area of soil, environmental and atmospheric science. During her time on campus, she’s been involved with the Graduate Professional Council, coached the successful Mizzou soils team and co-founded the Missouri Science and Technology Policy Fellows (MOST), which she said will be her greatest accomplishment when she leaves Missouri. The goal of MOST is to place either Ph.D. candidates, or people who recently received their Ph.D. in a STEM discipline, in Jefferson City. The fellows would serve as a resource for legislators while drafting or voting on bills, informing legislators of the benefits and consequences of their decisions from a scientific perspective. MOST is currently in the fundraising phase and hopes to have fellows in place during the 2021 legislative session. 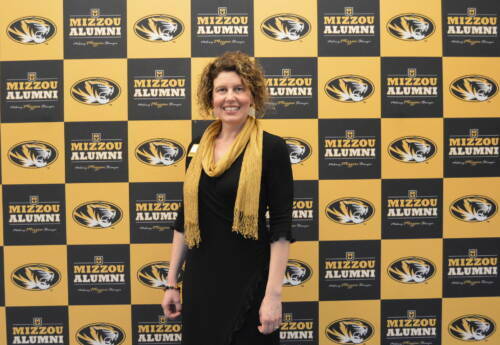 Rachel Owen, Ph.D. candidate in natural resources, was selected as one of the Mizzou 18 recipients. Photo courtesy of the Mizzou Alumni Association. Rachel said she was very excited when she received the email informing her that she was a recipient of the Mizzou 18 award. The recognition didn’t come without hard work. Rachel has two bachelor’s degrees from Iowa State University in agronomy and global resource systems and a master’s in plant science from South Dakota State University. Rachel is from Ankeny, Iowa, but didn’t grow up on a farm. She received a scholarship to study biology in a college of agriculture. During her freshman year at Iowa State University, she took a soil science course to fill a general requirement. After graduation, Rachel hopes to work in science policy, communication or outreach. Rachel said her advisors, Keith Goyne, Adjunct Faculty, and Lisa Webb, Assistant Cooperative Professor, have been fantastic and have served as mentors during her time on campus, pushing her in her research and acknowledging that her extracurricular activities were a key component in her career development. As Rachel prepares for graduation, she reflects on advice for students considering graduate school.